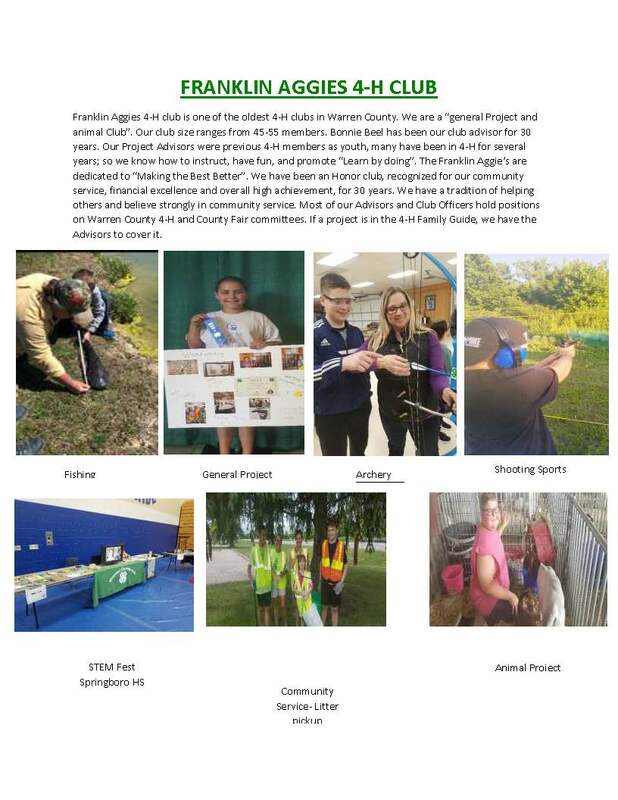 Check out the latest news from our 4-H clubs? We will be sharing news reports from our 45+ clubs here in Warren County. 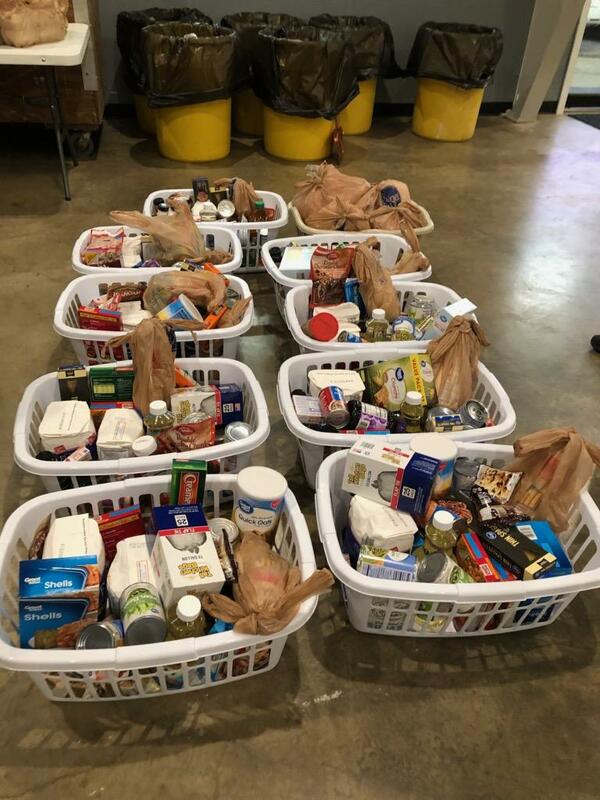 Also I attached a couple pictures of the food baskets we do. With part of the proceeds we make off of our Sweetheart dance we purchase chickens at the fair and donate them at Christmas time to interfaith hospitality network. Last year we were able to purchase 3 pens of chickens and provide 9 families with a chicken for Christmas dinner enough food for all of your traditional side dishes and desserts for Christmas, as well as two other complete meals, fresh eggs, some pantry staples, cleaning supplies and laundry detergent. Thanks to another successful dance this year we will be able to do it again!! You may or may not want those but just thought I would include them. If I only had two words to describe this experience, it would be life-changing. I was granted an amazing opportunity to go with my Health Heroes Program to Washington D.C. for the National Youth Summit for Healthy Living (NYSHL). I was one out of twenty-seven representatives selected from Ohio to help teach about mental health and vaping/juuling. Along with helping other members and advisors teach, I went to other sessions to educate myself more about mental health, making healthy choices, sleep deprivation, dating abuse, and youth resiliency. I attended another workshop about using Healthy Living Skill-a-thon activities through camps and other events. Some of these sessions were more beneficial than others but they all taught me valuable lessons I will use in my 4-H career and life. You may ask “What is Health Heroes?” It’s a statewide program for 4-H members of all ages located throughout Ohio who advocate healthy living. We advocate not just for physical health but for emotional and social health as well. The program was founded five years ago, but this is my first year as a member in this amazing program. You may also ask “What is NYSHL?”. It’s exactly what it says, it’s a summit not just for 4-H members, but for teenagers across the country. There are lots of sessions to be involved in, there is a lot of fun to have but it all revolves around different sections of health! point in time, I was spending so much time with members from Tennessee, that I noticed I started to pick up a southern accent. The NYSHL trip was extraordinary in different ways too. The day after we arrived at the National 4-H Conference Center in Chevy Chase, Maryland, other members of my health heroes group and I had planned to explore a little of D.C.. We got to tour around the Capitol Building, and we were also able to see the Visitor’s Gallery for the One Hundred Fifteenth Congress. I rode a metro for the first time and I will say that I really enjoyed trying something new. We got to meet members of high authority such as the representative of Ohio Congresswoman Joyce Beatty, and later on, on the flight home, Joyce Beatty herself was on our plane. Later during our trip, one night all of the members who attended the summit had gone on a night tour to see certain monuments and memorials around D.C.. Sadly, it was raining but it was still a unique time to learn more about the history of our country and D.C. itself. By the end of this trip, everyone was tired. We were in sessions for a large amount of the trip but we were constantly moving, constantly doing something but that didn’t make us want to stop. Everyone I met at the NYSHL had a reason to be at the conference, we all want to make a change in the world, a change that will do good. We were asked to create an action plan to take back to our communities that’ll open people’s eyes and want them to help make a change as well. We were asked to pick one problem that we witness in our counties that we want to change. I decided to base my action plan around mental health and dealing with depression. It’s still a work in progress just like everyone else's action plan is but I will make a change in my community one day just like I believe everyone I met at this conference will too. I know that not everyone was given the opportunity attend the summit, not many even knew it was occurring, but for the 300-plus across the country that did get to go and experience this event, it made a difference to all of us. The key takeaways I can take back from this involvement is it was a weekend of building new friendships, learning new skills, and most importantly becoming a better 4-H member and hopefully I can make the world a better place little by little. A look at what the Ohio Achievement Record can do for you! Leadership camp was one of the greatest experiences in my life. When I first arrived at the campgrounds, I thought it was going to turn out the opposite of that. It was a long car ride but it was worth it. When my mom and I walked up to the sign in table, they were testing for fevers to make sure no one spread it during this camp. I remember whispering to my mom, I hope I have a fever so I can go home. Sadly, I didn't have a fever at the time but later on I was thankful I didn’t have one. I didn’t want to go to this camp at first because I was so scared about not knowing anyone at all and being far away from home. Within 2 hours of sign in, I was settled in and I started to take in everything that I was surrounded by. I met my 1st friend at that camp within the 1st hour of being here. We ended up being inseparable the whole time we were there, we also ended up getting called sisters and twins (even though we look and act nothing alike at all). She was actually 2 years older than me but that didn’t matter, we learned a lot from each other and created memories we’ll hold to our hearts forever. She wasn’t the only friend I met while I was there, I had met several others and created memories with them as well. I went to this camp about 2 years ago and to this day I talk to a few of the friends from camp everyday. That’s not even the best part, I’ll be at a 4-H event and I’ll unexpectedly see someone from camp. 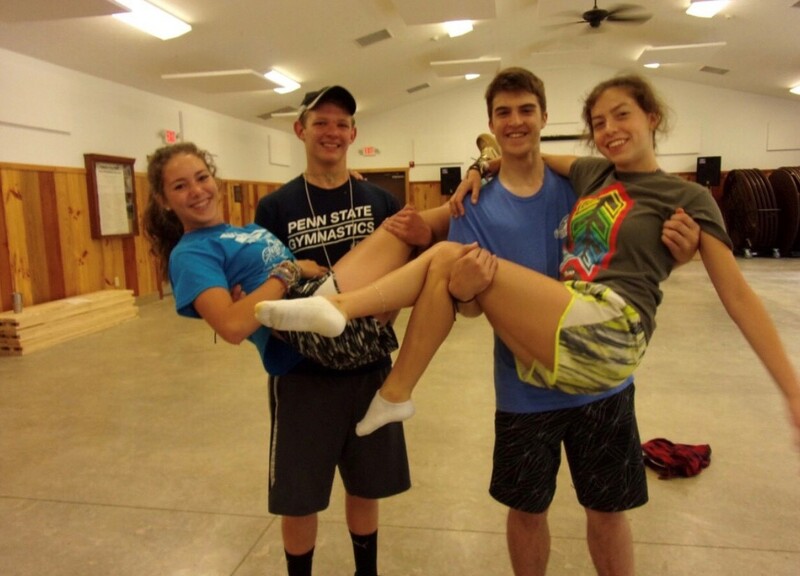 Such as my friend Quade, who had gave me the amazing lesson at camp, how to swing dance. I went home after I learned how and taught everyone I could, it soon became something I loved besides this camp. Everyone from this camp was from all across Ohio so even if we don’t get to see each other very often, we’re there for each other. Not only that, you learn from each other, you don’t just learn more and more about 4-H, you learn about life. You only make those types of friendships at camp and they’re the best friendships you’ll ever make, I can guarantee you that. Not only did I make some great friendships, I stepped out of my comfort zone. I put myself out there to meet new people, I’m typically more on the quiet side. 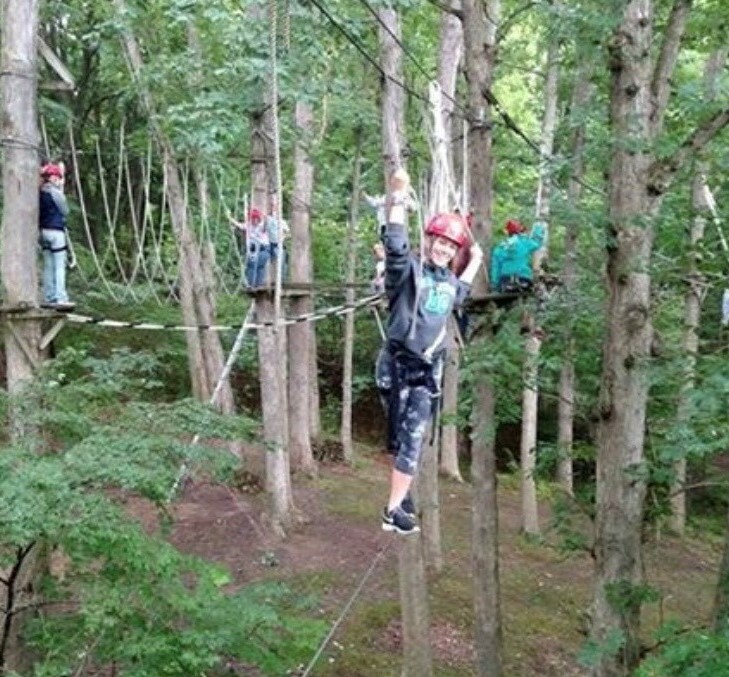 I also did many activities such as rock climbing and a high rope course. I’m not afraid of heights, I’m just afraid of falling at such great heights. I learned that from this camp, you have to try new things and put yourself out there. 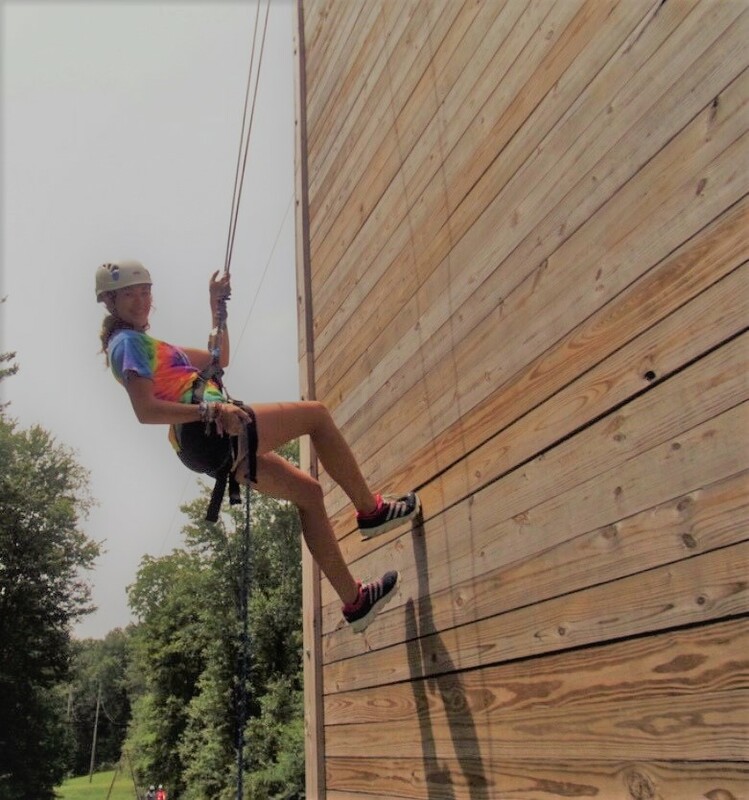 The camp is called Leadership camp for a reason, during this camp you learn and define what type of leader you are and your way of helping people, showing them that they can put trust in you. There’s other amazing leaders around you to guide you through the experience, the staff members, the counselors and the other campers. All these people help you have fun and create an experience you won’t get anywhere else. Although you have guidance, this is an experience that is based on you and learning who you are. It may be scary at first but you adjust and it changes your outlook on a lot of things. I would go back and do it all again if I could but other people need to experience this. If you get the opportunity to go to this camp, go! I promise you, you’ll have a great time! 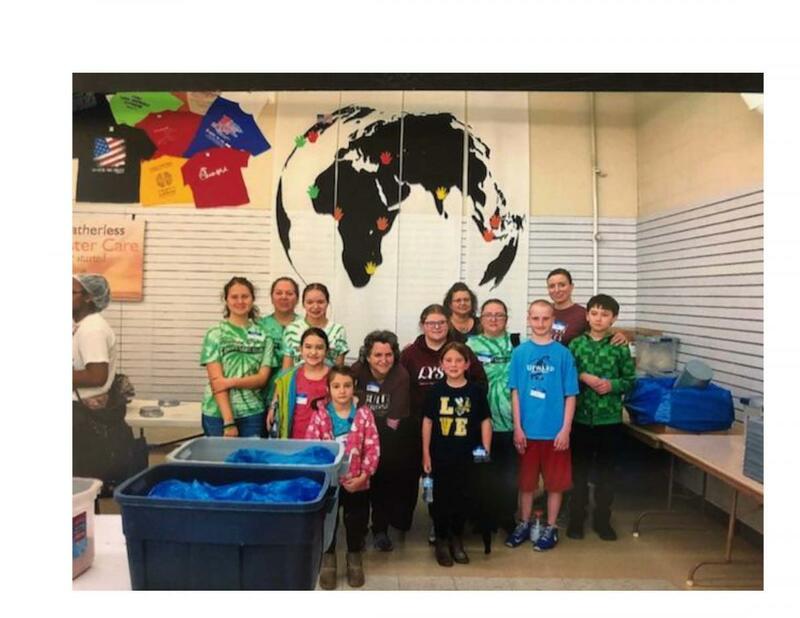 The WCDG Club participated in Hands Against Hunger food packing event in Blue Ash on April 21, 2018, for a club service project. Pictured are: Emmy Arnold, Haylee Kemper, Mackenzie Neal, JoJo Reidel, Carrie Reidel, Colin Neal, Abigail Schwieterman, Alex Yaekle, Adam Lane, Ally Neal, Haley Edrington, Hannah Neal, Britney Yaekle, Tori Kenline, Dixie Mathews, Josie Neal, Ben Holliday, Maria Lane, John Stevenson, Olivia Schwieterman, Emily Fox, Max Pierce, Dani Kemper, Helen Tiffin, Taylor Giltrow, Aliya Winkler. The Warren County Fair was once again a success for the Mid-Valley Riders. We won many ribbons and trophies. Our members participated in a wide range of projects including horses, pigs, goats, llamas, pheasants, alpacas, goats, rabbits, dairy cows, chickens, small engine, photography, art, and beekeeping. For the first time several club members took dairy cows. This year was an exhibition year with hopes that next year they will be a regular part of the fair again. Claire Monroe said this was probably her favorite memory from fair since she had never taken a dairy cow before. We had many successful horse riders. Megan Coffman won the Junior English Championship with her horse Prince. Sidney Fannin and her horse Sunny were Reserve Champion in Sr. gaited Equitation. Kierstyn Schmidt and her horse Reno brought home the blue ribbon in Novice English Showmanship. Mid Valley Riders also excelled outside the horse arena. Emily Hoffman won Reserve Champion Best of Show with her Champagne d’Argent rabbit. Laura Cauley was named Equine Princess in the King and Queen competition. Kara Cain’s pigeon won Grand Champion in the Other Fowl category. Copper Schmidt got a Blue Ribbon for his Pheasants. Sidney Fannin received the Reserve Champion award for the third year in a row for her photograph. Due to an outbreak of canine flu, the dog portion of fair was postponed until September. Several members of the club will be participating. We had several people qualify for state fair including Jenny Sedlatschek, Lexi Westrick, Logan Maxfield, and Sidney Fannin. The groom and clean team of Laura and Grace Cauley and Claire Monroe (with alternate Josh Beckman) won Grand Champion at our fair and qualified to participate in the state level competition. Overall all the club members enjoyed the fair and are looking forward to another great year in 2018. In other club news, Mid Valley Riders ran the Annual Warren County Fun Show on September 9. The event includes games and contest with and without horses. Kids and adults participated, resulting in a great deal of fun and laughter. A silent auction was also held. All funds from this annual event go to the Warren County 4-H Horse Advisors Committee. Two Mid Valley Riders excelled at State Fair. Jenny Sedlatschek came in second for her First Level Test One class for dressage. Sidney Fannin won Grand Champion for Senior Easy Gaited English and Western Pleasure. She was Reserve Grand Champion for Senior Easy Gaited Equitation. The Mid Valley Riders are very proud of their accomplishments. Recently members of the Warren County Dairy Goat Club participated in a community service project with Hands Against Hunger. This charitable organization helps to fight world hunger. It is estimated that 18,000 children die each day from hunger! After a short meaningful video, we assembled a healthy mixture of dehydrated foods into packets that are rehydrated later. These packets go to areas in need all over the world, including the United States. 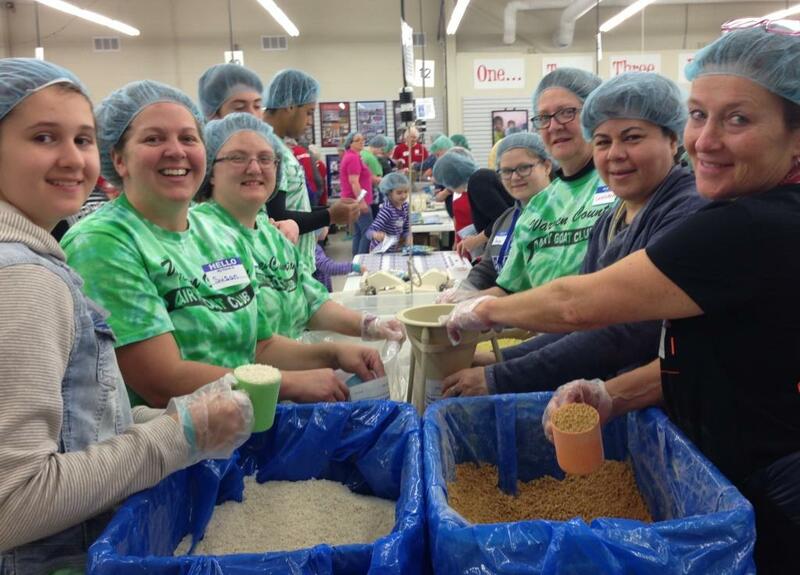 Together we made 150,120 meals! Thank you Hanna Neal, Community Service Officer for organizing this event for our group. Hannah Neal and Helen Tiffin, together are working on a county wide 4 H project for 2018 to combat hunger. Stay connected to learn more about this community service project soon. 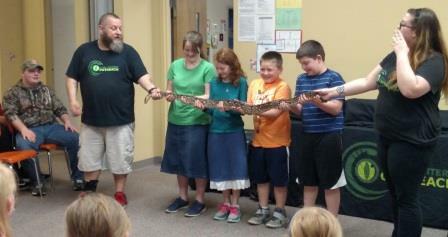 On April 19, our club, the 4-H Clover Crusaders, enjoyed a visit from Brain Gill and Cool Critters Outreach. They brought several interesting amphibians and reptiles, including a tortoise, several lizards, and two snakes. The club members were able to hold and pet all of the cool animals they brought. The Mid-Valley Riders started off this year by electing new officers at our Holiday Awards Party and meeting in November with the following results: President, Logan Maxfield; Vice President, Megan Coffman; Secretary, Sydney Fannin; Treasurer, Claire Monroe; Health Officer, Kara Cain; Safety Officer, Adam Cain; and News Reporter, Cooper Schmidt. Our focus is to keep meetings short and concise. We also plan to add more interaction for members to get to know each other better. Valentines were made in early February and then delivered to a local health care center, with the members visiting and listening to the residents. In November, the Mid-Valley Riders held their annual awards party. Officers for 2016 were elected along with an installation ceremony. 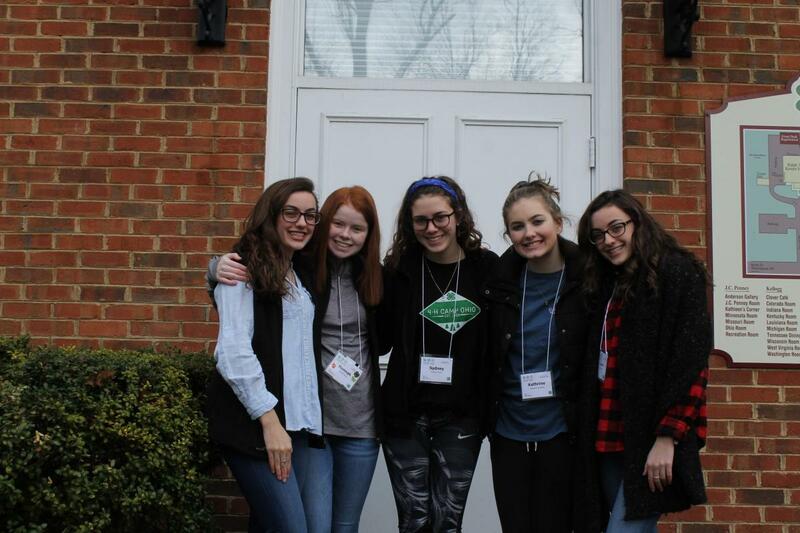 They are: President - Jennifer Sedlatschek; Vice President - Alexis Westrick; Secretary - Sydney Fannin; Treasurer - Logan Maxfield; Health Officer - Claire Monroe; Safety Officer - Allison Bishop; News Reporters - Kelsea and Emma Madden. Another busy year is planned! Mid Valley Riders club members, parents, and advisors all "Thank You" for your support in 2015. The Mid-Valley Riders, led by officers Jen Sedlatschek (President), Lexi Westrick (Vice President), Grace Cauley (Secretary), Adam Cain (Treasurer), Elizabeth Martin (Health), Sydney Fannin (Safety), and Tyler Sedlatschek (News Reporter), have had a very busy year. They made suet cake bird feeders together for the wild birds during the winter months. 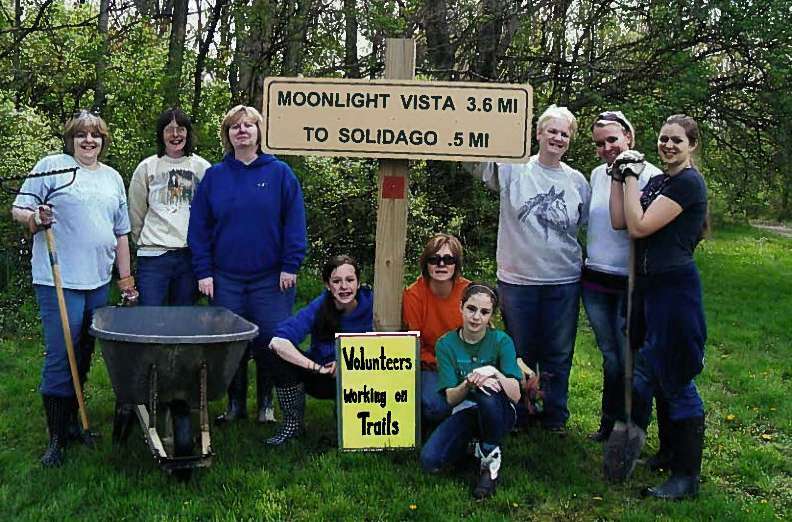 They participated in community service projects and fundraisers for the club. They went on a field trip to the Kentucky Horse Park and Rood/Riddle Equine Veterinary Hospital in late spring. They were very involved at the Warren County fair as well. Members participated in horse shows every day, livestock shows, and exhibited general projects. The club had several Junior Fairboard members this year, a department queen, won third place in the banner competition, as well as high placings in Groom and Clean. (The Junior team will go to the state competition.) Many awards and trophies were received by members throughout the week. The club also won the Clean Aisle award during the week of fair. Several members qualified to compete at the State Fair with their projects and shows, with excellent results. Overall, members had a great week at the county fair and enjoyed being together. Their teamwork and sportsmanship toward each other was noticed by others, and shows how well this club works together. The fall will continue to be busy for the club, with community service projects and fundraising activities planned. There are also fun social activities being planned. 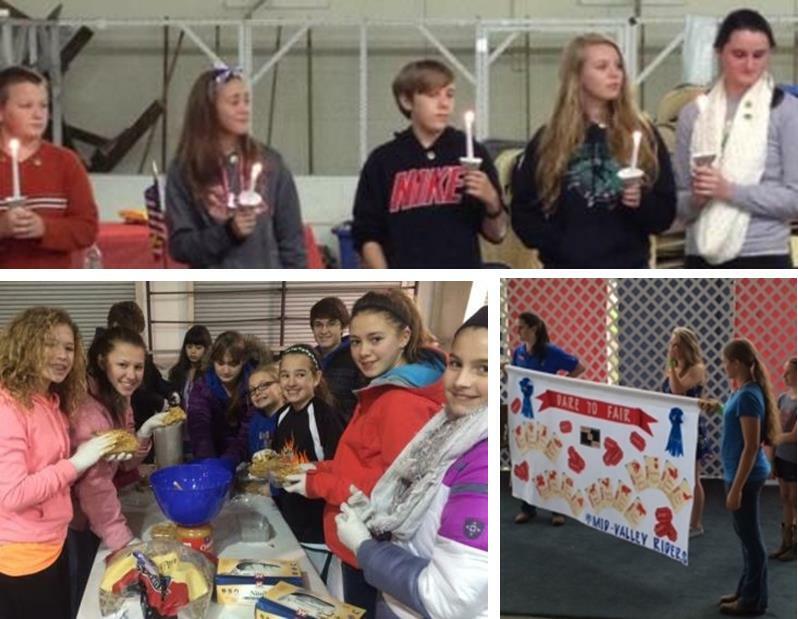 In September, the club ran and worked the Fall Fun Show held at the Warren County Horse show arenas. Adults and kids alike played the games, with and without horses. A great time was had by all. The club will end the year with an awards/holiday party in November with election and installation of new officers. 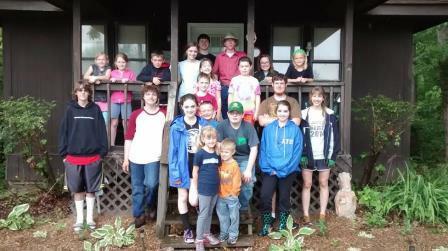 On May 16th, the 4-H Clover Crusaders participated in a Camp Graham clean up day. Members weeded, trimmed and transplanted shrubs, planted flowers, and mulched to prepare the camp grounds for the camping season. With the help of adults, bat and owl houses were hung in trees in various areas around camp. The goal is to create homes for these animals to help with the mosquito and mice populations. After a hard day’s work the club enjoyed sharing food and fellowship. On our trip at Young's Dairy Farm we learned how ice cream and Swiss cheese was made. We also got to milk a virtual cow and go on a hayride. Afterwards we fed goats and got some ice cream. Warren Co. Dairy Goat Club Celebrates! At our club meeting on June 18th the Warren County Dairy Goat 4-H Club enjoyed a pizza party from Nina Roberts who is the president of the Franklin Aggies 4-H Club. Nina organized Head, Heart, Health, Hands for Troops and our club donated the most items for the troops! This picture shows our members enjoying pizza with Nina. In April, the Clover Crusaders enjoyed a very informative visit from Caesar Creek State Park Ranger Mandy Wolski. Ranger Wolski brought in pelts that included the red fox, coyote, beaver, raccoon, muskrat and mink. 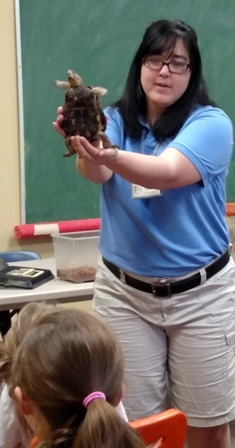 Crusader members experienced touching an Eastern box turtle, a snapping turtlem a painted turtle, a spotted salamander and a black rat snake. The club really enjoyed her visit. 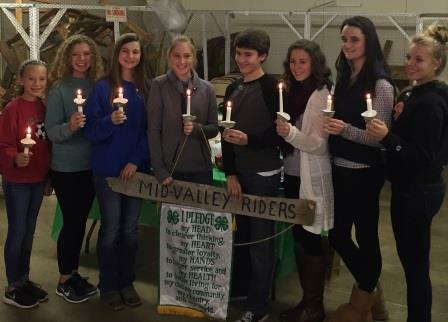 The 4-H Clover Crusaders recently elected new officers for 2015. Anna Honorlaw will serve as president and Natalie Kritzer as vice-president. Cole Branham is the club treasurer and Allyson Kritzer is the secretary. Recreation Committee members include Josh Maile, Sophie Goldschmidt, Chrissy LaJoye and Rosie Briggs. Welcoming Committee members are Jacob Goldschmidt and Bobby Black. Rebekah Davenport is serving as news reporter. Mike Williamitis will be the health officer and Caroline Briggs will serve as safety officer for the club. The 4-H Clover Crusaders have been busy with community service projects. 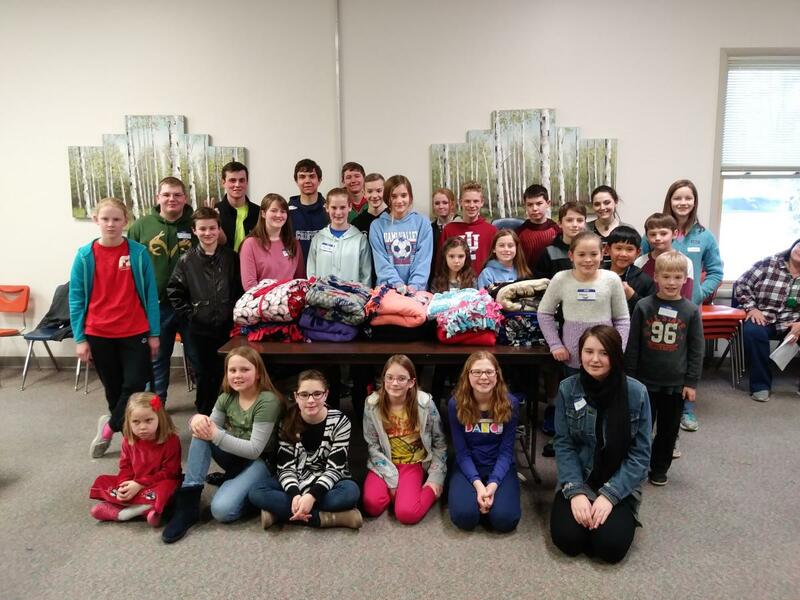 The Clover Crusaders made no-sew fleece blankets for the Inner Faith Hospitality Network of Warren County in February. The club was awarded the “My Hands to Larger Service” mini-grant which will be used to purchase mulch, flowers and materials for the club to build bird, bat and owl houses for Camp Graham. At our meeting on Tuesday, February 10, we held our annual elections. This was the second meeting of the year. In addition to elections we covered paperwork and project selection for the year. Our 2015 Officers are: Caitlin Ralph, President; Lindsay Ralph, Vice President; Madison Miller, Secretary; Garrett Lenart, Energy Leader; Morgan Watson, Health & Safety Leader; Joshua Ralph, Photographer; Loni Watson, Scrapbooker; Chloe Miller, News Reporter; and Zachary Ralph, Recreation Leader. On March 24, we finalized our project choices and submitted paperwork. Members had decided to make their own club t-shirts and today we tie-dyed them. We used dark and light green dyes. Once they are dry, a clover and "Warren County Clover Rangers" will be ironed on to each shirt. We completed a diagram of a turkey by labeling all the parts we knew. Cloverbuds also had an activity. 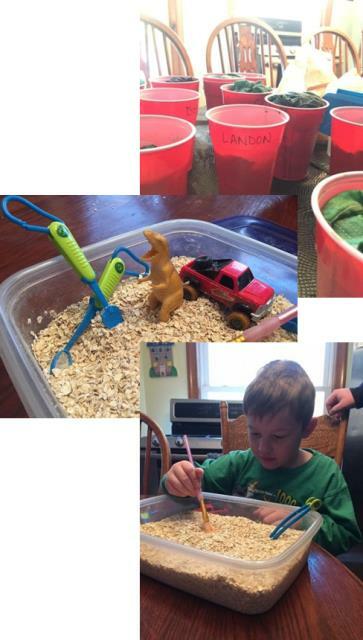 They "excavated" a dinosaur. There was a tub of oats, small tools, and a truck to pretend. They learned how fossils and remains are carefully dug up from the ground. At our meeting on Tuesday, February 17, we elected officers. Our 2015 President is Savannah Burlile. Vice President is Olivia Neff. Amber Phillips was elected Secretary, Joseph Pinell was elected Treasurer. I, Rachel Maples, was elected news reporter. We have five Cloverbuds this year and Britt Burlile is our Cloverbud Adviser. 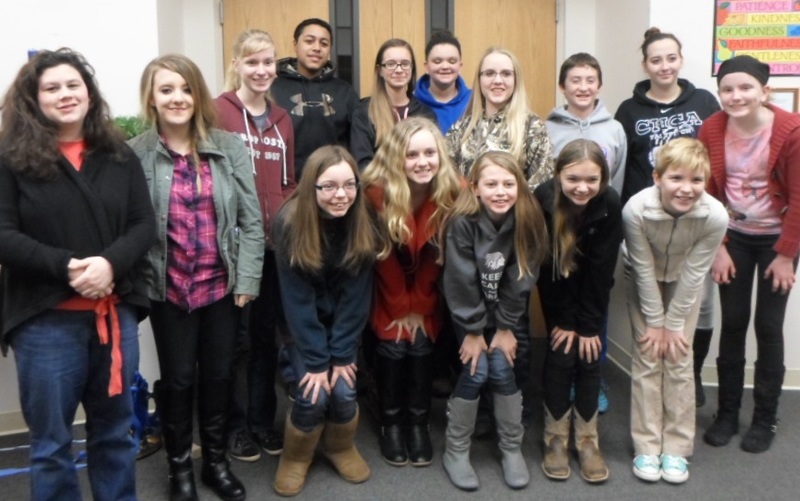 The Warren County Dairy Goat 4H Club elected 2015 officers on January 15th. President: Isaac Bendel; VP: Britney Yaekle; Secretary: Whitney Kenline; Treasurer: Max Pierce; Historian: Alex Yaekle; Health Officer: Taylor Giltrow: Recreation Leaders: Aliya Winkler and Emily Fox; Safety Officer: Tori Kenline; News Reporter: Joanna Bendel; Community Service: Della Arnold and Elyse Camerer; Flag Officer: Eva Camerer. Also pictured is Emma Dierkers. Our club is planning a goat display for the Farmers’ Breakfast at Lebanon High School on February 28th and a concession booth for the Goat Clinic at the fairgrounds on April 11th. No Re-admittance. There will be chaperones. These members come to us with great knowledge on Nutrition and Clothing projects along with great leadership and interpersonal skills! for the Warren County Fair Clothing and Nutrition Exhibits. 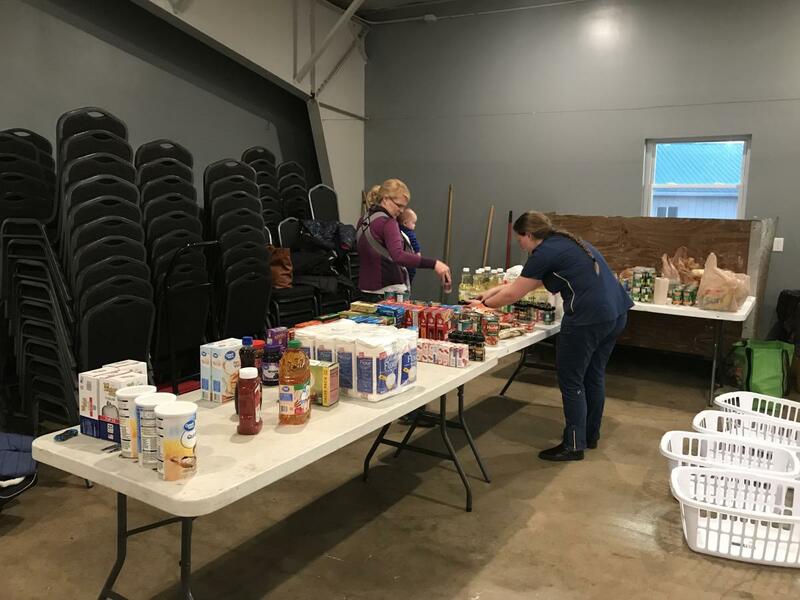 The Warren County Food and Fashion Board members organize Clothing and Nutrition events related to the county fair, host the Senior Reception, community service, educational activities, and more. A few weeks ago our club brought in a service dog to talk about how the dogs can show the blind what to do. We also made valentines for a local nursing home. Our club even made fleece blankets for a local homeless shelter. A special thanks to all who helped in the Camp Graham clean-up. We want the campers to have a nice camp. We hope to see you there! When I got out of the car I was excited because I’ve never made anything out of clay. Then I walked in the door and I loved that smell of the fresh clay! Mike and Karen make their own glazes. First Mike introduced him and his wife, Karen. We all got ready to make our bowls. Karen cut some squares of clay for all of us. You can use stamps on them, write or you can just draw on whatever you make. You can make things like bowls, cups, plates, even pots. Here is a fun fact about Mike. His last name is German for tree! So when you see a tree on the back of the bowl that means Mike made it. Karen put’s KB on her pieces so you know that Karen Baum made it. When I walked in and smelled the fresh clay! When I found out about Mike’s last name! When I found out that Mike and Karen make their own glazes. I would pick this Pottery Store every time I need bowls, vases, forks, spoons or even cups because their creations are amazing. So please pick Baum’s Pottery! I would like to thank Mike and Karen Baum for sharing this wonderful experience with all of us. I hope we can go back sometime soon. 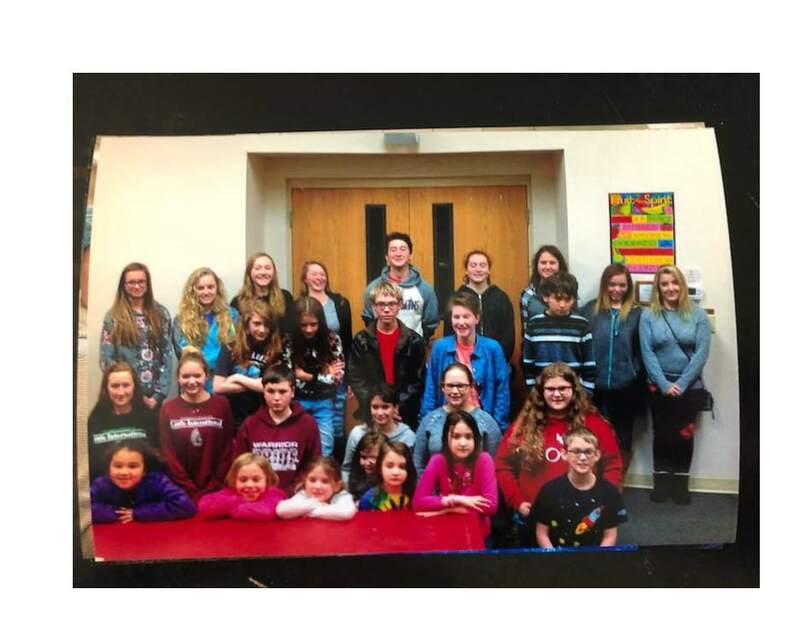 On February 27th, 2014 the 4-H Clover Rangers had their first guest speak of the Season. Mrs. Shannon Miller came to spoke to us about being a photographer. She runs her own business called Memories by Miller Photography. Her specialty is nature and babies. Mrs. Miller explained to us why sometimes a picture can get blurry. She said “Sometimes pictures will get blurry if you had the camera and you took the picture and then moved really quickly.” So when you print the picture out it might look a little blurry. The thing I enjoyed most about the pictures was a picture of the baby with the rose on her head. I thought that the picture was very cool and detailed. Mrs. Miller inspired me to take pictures of my own. The Warren County Dairy Goat Club elected officers for 2013-2014 at their October meeting. They are: President Sarah Doughty; Vice President Della Arnold; Secretary Whitney Kenline; Treasurer Isaac Bendel; Recreation Alex Yaekle; Safety Officer Aliya Winkler; Health Officers Taylor Giltrow and Tori Kenline; Community Service Seth DeLaVega; Newsreporter/Historian Britney Yaekle; Flag Officer Liz Hicks. On November 17th, 2013, the Mid-Valley Riders had a holiday party. The kids decorated gingerbread houses. They will be donated to Pinecrest Nursing Home in Morrow. Everybody helped themselves to the buffet. There was a business meeting and the awards were handed out to families. The officers gave their election speeches and new officers were installed. We had a group photo and then we exchanged gifts. We played games like hang the ornament and reindeer noses. The Mid Valley Riders will work at the Warren County Horse Parade in December. The Mid Valley Riders will meet again in January. On April 6th, members of the Mid Valley Riders attended the Lil International Showmanship Clinic at Wilmington College. Members learned how to show all common livestock animals, and then participated in a show. Members did well in their shows. Everyone had a fun time! Later that month, members attended the 4-H Public Speaking Clinic and participated in Green-Up Day at Caesar’s Creek. 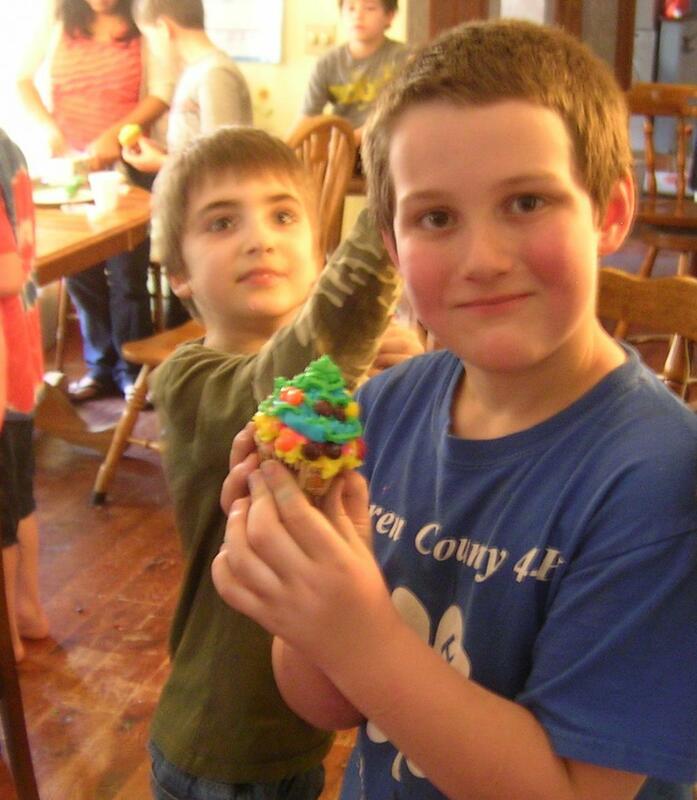 On Wednesday, April 10, the 4-H Clover Rangers learned how to decorate cupcakes. Teresa Prince came in and demonstrated how to decorate cupcakes with icing, fondant and candy. Prince is a wonderful cake decorator, but considers it a hobby and does not decorate for a living. She made beautiful cupcakes -- way better than ours. Most of the cupcakes we made were piled high with icing and stacked with candy. Each of us made two super sugary cupcakes, each with about 5 pounds of decorations on top. As we squirted icing to our heart’s content Prince sat back and praised our masterpieces, although we all knew they weren’t that good. Don’t worry, the cupcakes tasted a lot better than they looked! After eating one cupcake, you began to feel sick from so much icing! Even though some of us weren’t the best cupcake decorators, we still had a really fun time with Prince and appreciated her willingness to come demonstrate cake decorating to us novices. 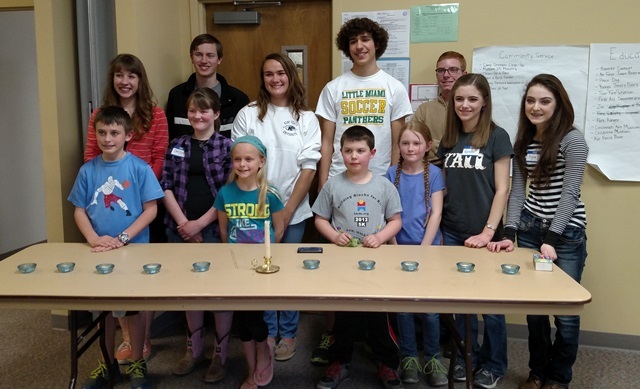 On March 30, members of the Odyssey and Camelids 4-H clubs were able visit Brookside in Mason, Ohio. Members brought rabbits and alpacas for the residents, other visitors and employees to enjoy. They were able spend time with and learn about the animals. We were not able to take pictures, but the big smiles let us know how much they enjoyed the animals. Thank you to the residents, their guests and the employees at Brookside for allowing us to spend time with you. 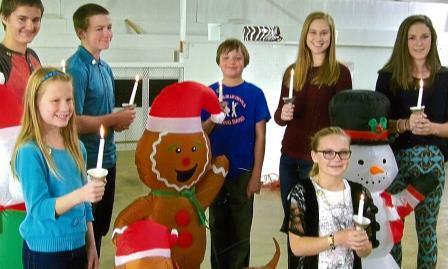 The 4-H Clover Rangers went to Baum Pottery on March 27. Mike Baum showed them around his studio and demonstrated how to make pots and plates on the pottery wheel. Baum showed the 4-H Clover Rangers his kiln, which he designed and built himself. The kiln was so big that the rest of his studio seemed cramped. Despite the fact that his studio wasn't the cleanest or biggest space, Baum's work was amazing! He had many pots, mugs, plates and teapots piled on the shelves. Baum gave our members really good advice about working with clay: the key to consistency is a lot of practicing, weighing and measuring. After Baum demonstrated how to make simple pottery, he showed us around his pottery store. It was no surprise that Baum's work was so amazing when he told us that he had been working with clay for almost thirty-three years! 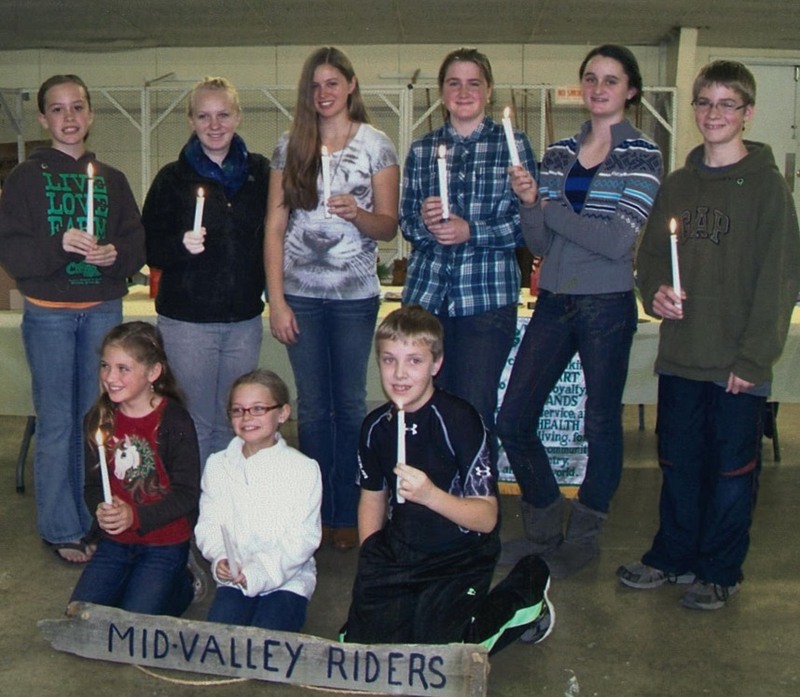 In November, the Mid Valley Riders 4-H Club had their holiday party and awards dinner. The members met in Building A at the Farigrounds from 1:00-6:00pm on Sunday, November 18. Families brought dinner to share. Members received awards and officers were elected for 2013. The newly elected officers include Becky Sedlatschek, president; Kaitlin Paxson, vice president; Kayla Cain, secretary; Alexis Westrick, treasurer; Andrew Cain and Megan Coffman, health officers; Tomi Rose Burkhart and Angela Shetterly, safety officers; and Tyler Sedlatschek, news preporter. The day ended with a gift exchange and games. On Sunday, December 1, members helped run the petting zoo and food booth held at Trupointe feed store in Lebanon during the Lebanon Horse Parade. This was a fundraiser for the club. Saturday, October 20th, Mid Valley Riders 4-H Club organized a petting zoo as a community service project at a school for disabled children in Lebanon, Ohio. About 18 children and their families attended. They enjoyed all the different animals and the pony cart rides. The animals brought in were chickens, goats, miniature horses, alpaca, and a donkey. The 4-H club members helped the families safely pet the animals. 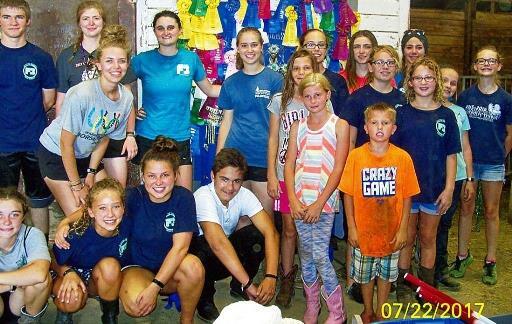 Last summer girls from this Warren County 4-H Club went to Lebanon to help secure donations for Special Fly masks with UV eye protection for 7 blind horses. One of these great horses was Lindsey Schwarber’s 4-H horse “I’m So Southern” known by all of us as Sam. Lindsay showed Sam at the Warren County Fair for 6 years in Western, English and Jumping classes. Lindsay and Sam’s favorite class was Working Hunter over Fences and they were very competitive even when Sam started losing sight in his right eye. They competed several times at the Ohio State Fair and were especially proud to their 2006 Reserve Champion title earned by placing second out of 62 contestants in Hunter under Saddle. When Sam started losing vision in his other eye, Lindsay decided it was time to begin researching places to board Sam so he couldn’t hurt himself. She found this wonderful place in Montana called Deer Haven Ranch Animal Sanctuary. 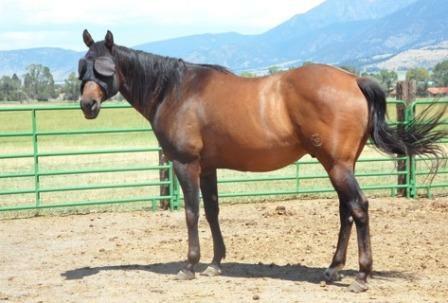 This year our club decided to help out Sam and 6 other blind horses living at Deer Haven Ranch by providing Guardian Masks to protect their eyes from the sun and pesky insects. The girls are thankful to all the good people in the Lebanon community who supported their efforts. Lindsey is currently serving the Army National Guard and has been deployed to Afghanistan. She relies on regular web updates from Deer Haven Ranch on how Sam is doing. On February 29, 2012, officers for the Warren County Dairy Goat Club were elected. They are: President, Jen Eckles; Vice President, Sarah Doughty; Secretary, Lauren Robbins: Treasurer, Martin Bendel; Historian, Julie Hobbs; News Reporter, Joanna Bendel; Recreation Leader, James Hobbs; Safety Officer, Missy Emery; Health Officer, Elyse Camerer and Community Service Officer, Rachael Emery. The club met again on the 28th of March when Aliya Winkler gave a demonstration on showing rabbits and Julie Hobbs showed us how a llama's ears can tell us its mood. Missing from the attached picture is Missy Emery. 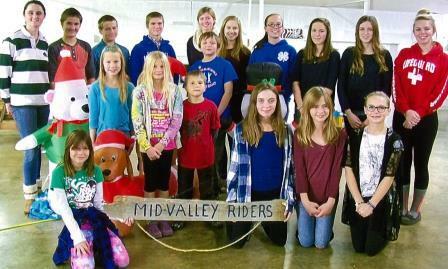 Mid-Valley Riders had their first meeting of the year on January 14, 2012 with their new officers in place. They are: President: Ruthanna Thomas; Vice President: Megan Westrick; Secretary: Kayla Westrick; Treasurer: Alexis Westrick; Health Officer: Kaitlin Paxson; Safety Officer: Jennifer Sedlatschek; News Reporters: Andrew and Adam Cain. After a year of serving the community by visiting a nursing home to send a message of love, cleaning up parks, and displaying a petting zoo, our club's intentions remain the same this year in hopes of giving even more back to our community. We grew in our 4-H experience by participating in educational clinics, field trips, horse shows, fair, fundraisers, and various camps. The 2012 club calendar of events was discussed with similar activities and new experiences that will bring forth growth in each of our members. This was followed by members' demonstrations. The next business meeting is February 4, 2012. Most of you know that our daughter Joanna has difficulty making proper speech sounds. We not only wanted you to share in Joanna's success and growth but also to encourage any of you or those you know who might be facing similar issues and considering a communication device like Joanna's. Joanna's 4-H project this year centered around increasing awareness of those who need to use communication devices in every day life. We were approached last spring about Joanna taping a segment for "Tell Me A Story" for Cincinnati Children's Hospital. It has just now been made public. Apparently the American Speech and Hearing Association may want to use it for a project they are doing also. Joanna Bendel communicates to the world with something she calls her "talker." It is an electronic communication device that acts as the 14-year-old girl's voice. Joanna has apraxia, a motor speech disorder that makes it hard for her to speak and be understood. She knows what she wants to say, but her brain has difficulty coordinating the movements necessary to make the words. But Joanna wants people to know she still has a lot to say. This video is two minutes long and can be viewed on Cincinnati Children's channel on YouTube or just by Googling "Tell Me a Story" with Joanna's name.